Caution: Portions of the following contain humor. If you have no sense of humor, discontinue reading now. Well time has certainly passed since I started working with precast terrazzo. I could say that I had worked across five decades—which is true, since I started in 1979. But a more accurate accounting says this year is Number 33. During this time, I have ground and polished more than my share of terrazzo. As with any basic process repeated endlessly over time, one comes to a deeper understanding of just what the heck one is doing. This is called insight (seeing the inner nature of the same old thing). And so it goes with grinding and polishing, two critical steps that help distinguish precast terrazzo from its lately more popular first cousin, cast concrete; or more accurately, precast concrete. The insightful difference between grinding and polishing, in essence, is this: grinding is scratching a surface; and polishing is melting it. Here’s a simple experiment you can try at home to help make your understanding of grinding more, um, concrete. First, buy a shiny new car (I like Lamborghinis). Next, put a bit of beach sand on the hood. Place a smooth brick on the sand, and rub briefly in a circular motion. Remove brick and sand, and observe. You will notice score marks on the surface, and dust. The grits of sand, being harder than the paint, have scratched furrows into the surface. Behind the scratching action of the grits, plumes of dust have come out of those furrows. This is grinding at its most basic. You want to grind wet to remove the dust, expose new surface, and keep your grinding medium clean and sharp. Polishing terrazzo is entirely different. You are ready to polish when you have ground with successively finer grits, say 400 or 500 grit, and no scores are visible. The terrazzo should be bone-dry for best results. You can buy polishing powder or mix your own by combining tin oxide, powdered oxalic acid and flake shellac made from the bodies of the Asian Lac Beetle. (Wear a respirator.) Change the grinding head to a polishing pad or “mop.” Put some powder on the surface and mist it with a spray bottle. Spread this mud evenly over the surface with the polisher, moving in small tight circles. As it begins to dry out, bear down strongly on the polishing head to create heat of friction. Move slowly. This heat and pressure will superficially “melt” the surface, creating a vitreous surface. Mother of pearl shell, when polished in terrazzo, will light up and become incandescent from the heat—truly a sight to behold. Caution is indicated, as it is possible to overpolish and “burn” a surface. You then have to regrind and repeat all the steps once more. To recap, once again, grinding is scratching, and polishing is melting—completely different processes. These can both be done by hand, but are extremely tedious. I did this handwork my first three seasons before I even knew that I was doing terrazzo, or that equipment existed. Specialty aggregates are great design elements, and they add a lot of pizzazz to the terrazzo. 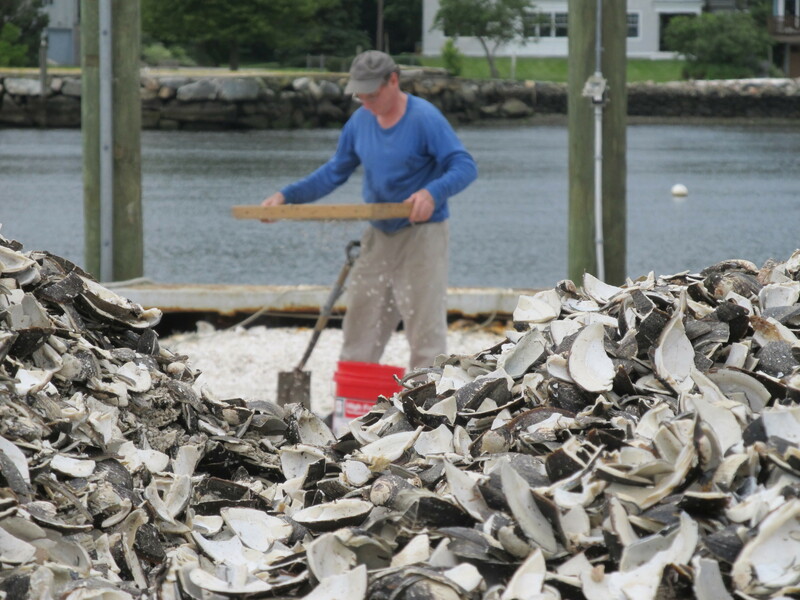 I go to the coast of New England to source oyster shells, which I crush and grade myself. This is the recycled waste from the seafood industry. Oyster shells are wonderfully variegated, and take a nice polish. Crushed mother of pearl shells have the same gorgeous iridescence as the pearls themselves. They are the recycled waste from the cultured pearl industry. Aluminum and brass “chaff” are sourced from the waste stream of industries that mill these metals to make their products. They are small bits of metal that catch the light and add visual interest. Aluminum chaff really pops against a black background. Brass and aluminum letters are another specialty option. They create custom surfaces that speak. I have pulled a lot of mirrors out of the trash. I crush and sift them. In terrazzo, mirrors create a dazzling effect, much like feldspar that occurs in granite. Venetian terrazzo consist of oversized aggregates—so called because the palazzos in Venice used these large aggregates, to handsome effect, in their floors. More grinding is required in the process. 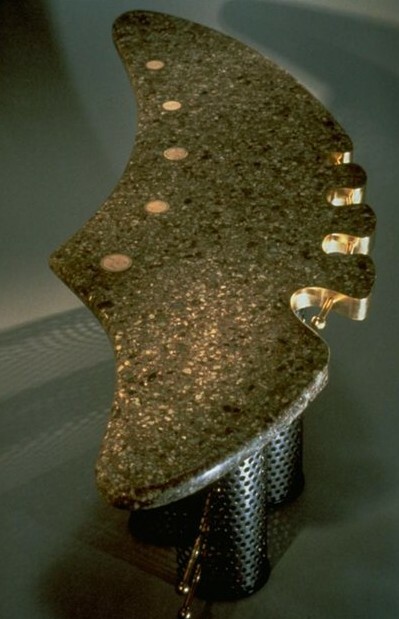 All manner of minerals, such as geodes and fossils, can be inlaid in terrazzo. You can find some great items at your local gem and mineral show, and it won’t break the bank. Glass aggregates are abundant and are another recycled ingredient. Use them with a translucent matrix, and you can create giant “lenses” of whatever colors you choose. There are other options, but the trick is to choose aggregates of a similar hardness, so that it all grinds evenly. I am constantly challenging the technical limits of terrazzo and find the creative possibilities increase yearly. I began exploring crushed glass and epoxy terrazzo in 1994 and found the material to be quite versatile and colorful. It behaves differently than your classical cementitious terrazzo in several ways. For one thing, it can be cast in very thin tolerances. Using a clear matrix with recycled glass, I was able to produce “translucent terrazzo”— a largely vitreous surface that lets light pass through it. This ground polished terrazzo surface is essentially a lense. The color of the lense is infinitely programmable, based on your glass mixes. The trick is to always use a strong percentage of clear glass as your base. Translucent terrazzo as a countertop or bar top can be visually dazzling, particularly at night. Mount long fluorescent lights below the surface and a diffuser in between to evenly spread the light. 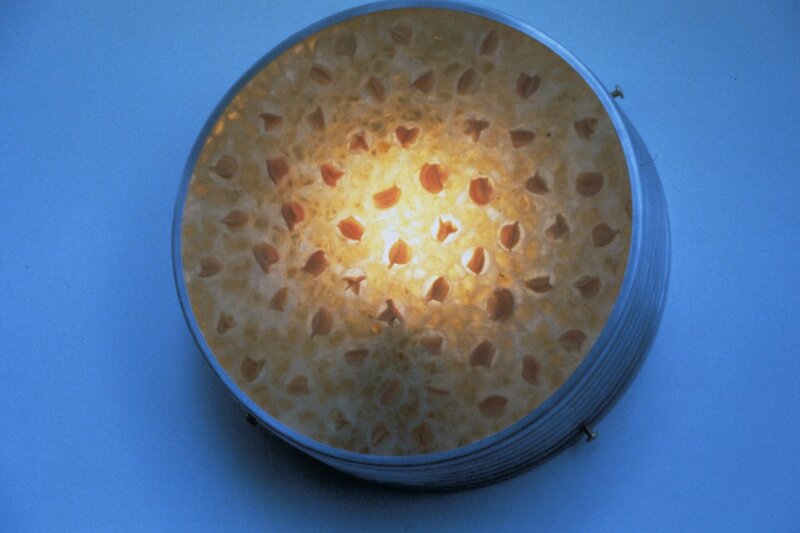 The surface itself becomes a glowing lamp and depending on how you set it up, it can provide ambient light or function as a night light, to dramatic effect. Excited about this new material, I created a variety of wall-mounted lamps with varied lenses that I named The Porthole Sconce Collection. Porthole because the circular lamp was housed in a round and decorative spun aluminum can that was produced by the now-defunct Gem Metal Spinning and Stamping Co. in Long Island City, NY (see The Story Behind the Vase Table to learn about the aluminum spinning process). Wiring the guts of the lamp and the switch was simple enough, but my first bulbs were incandescent. Although vented, heat built up in the can and discolored the prototype lense. Switching to cooler CFC bulbs solved this concern. I had located a local source for crushed glass at the time I was making the translucent terrazzo lamps – National Display Materials on North Sixth Street in Williamsburg, Brooklyn. Run by the genial Adolph Brenner, their business was largely supplying aquarium glass to pet supply stores on the East Coast. They had their own onsite crusher. They bought waste glass from bottle manufacturers. I watched the nascent Williamsburg hipster phenomenon pick up steam and saw how small manufacturers were being steadily displaced. In 1996, National Display Materials closed their business. I did the usual, which was to buy a couple of tons of crushed glass at close-out prices. The cost of shipping aggregates can be as much as the cost of the aggregates themselves, so one does not hesitate to buy in this situation and do the shipping yourself. 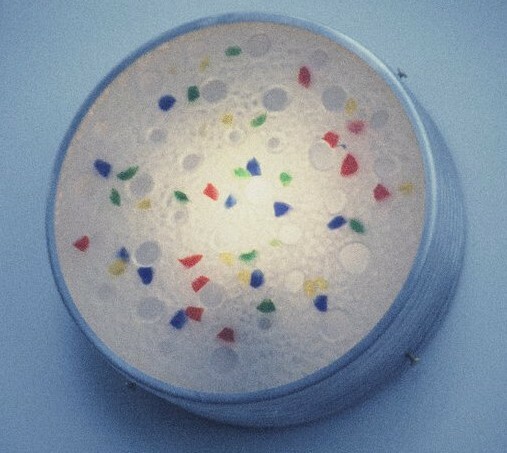 I showed The Porthole Sconce Collection of translucent terrazzo lamps at the International Contemporary Furniture Fair — and they were a big hit. They received coverage in Residential Lighting and Home Lighting and Accessories, two trade magazines. I sold some lamps, and despite strong interest from lighting retailers, I discovered that I had little interest in becoming a lighting manufacturer. This experience helped me understand my true passion for doing precast terrazzo. I am attracted to furniture, surfacing and custom work. This is still the case. If you need a translucent terrazzo surface, give me a call. Dolphin and Brooch Table are part of my Furniture as Jewelry series. These pieces were designed as oversized brooches, and reflect the fundamental lapidary nature of terrazzo as a medium. The mosaic tables are perforated by brass rods, or embedded with brass elements that create textural counterpoint to their otherwise smooth, polished marble surfaces. Mosaic graphic designs are rendered in brass cloisonné. Dolphin Table was declared a winner in the nationally juried art furniture competition, Furniture of the Nineties, sponsored by the American Society of Furniture Artists and Parson’s School of Design.